When it comes to making a smart investment in the single-family rental sector, a lot of it boils down to math. The good news? It’s not calculus. The better news? Modern solutions can significantly streamline the process and help eliminate projection errors. In this two-part blog series, we’ll explore the process of evaluating investment property ROI, and break down some of the questions you might have as a first-time rental home investor. It's easy to fall down an Internet rabbit hole of percentage-based rules—and varying opinions on them—when researching how much to spend on an investment property or how to calculate ROI. Just remember: These rules for investment property ROI aren’t hard and fast. Think of them as screening tools or benchmarks in a multi-step process that also takes property quality, location and tenants into consideration (we explore this more in Part II). The aim of the one percent rule is for rent to be close to one percent of the purchase price of the home (this includes the cost of urgent repairs or improvements). By this standard, rent will generally be greater or equal to the mortgage payment. Buyers use the one percent rule to immediately ascertain how a property will cash flow. Scenario 1: If you can collect $1,600 per month in rent and you paid $200,000 for the property, you are collecting rent that is 0.8 percent of the purchase price. This checks one item on the list of things to examine. Scenario 2: If you can collect $1,600 per month in rent and you paid $400,000 for the property, you are collecting rent that is 0.4 percent of the purchase price. This is farther away from the one percent benchmark. The one percent metric is not a guarantee of cash flow. Nor should it be the primary metric used in making investment decisions. For example, an investment property might have good cash flow, but come with higher investment risk due to other factors like the neighborhood quality or local vacancy rates. This rule of thumb states that the total cost of owning a rental property, excluding the mortgage and interest payment, should be about 50 percent of the gross rent. While this is a quick and easy way to estimate cash flow, it’s not as accurate as using actual expected numbers and shouldn’t replace a more thorough property analysis. 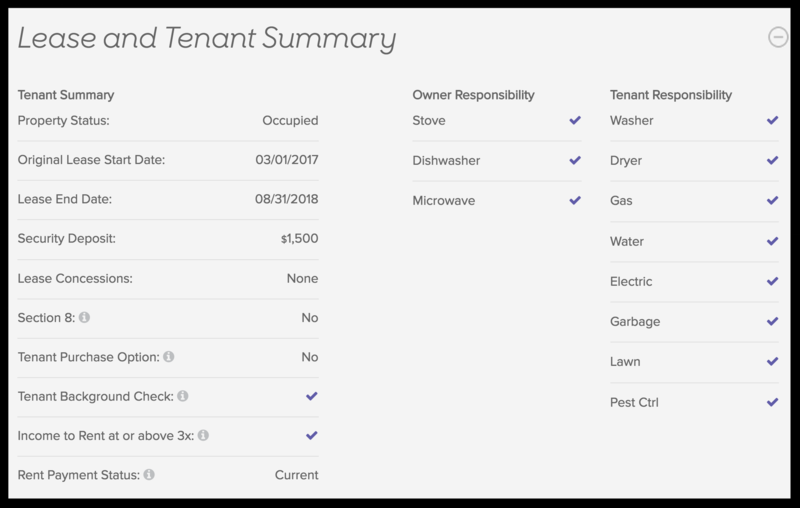 Above: Roofstock provides a lease and tenant summary upfront for all of its listings, which makes it easy to see at a glance what expenses the tenants are responsible for covering. Be sure to review carefully the property’s financial pro forma, or cash flow projection that includes forecasted expenditures and returns. Knowing true costs will help guide your purchase decision. Cap rate: The estimated rate of return on an investment property. Cap rate is calculated by dividing net operating cash flow in the first year by the property purchase price. Cash-on-cash return: Your annual pre-tax cash flow/invested equity (aka, cash income earned on the cash invested in a property). This doesn’t take into consideration some of the other benefits of rental property ownership, including appreciation, loan paydown, depreciation and other tax benefits. Whereas calculations based on standard ROI take into account the total return of an investment, cash-on-cash return only measures the return on the actual cash invested. To see this tool in action, visit our marketplace and click into any property. Understanding the variables that go into evaluating potential investment property ROI is an important part of becoming a savvy property investor. That said, you can also take advantage of modern tools and platforms that help streamline the process and reduce projection errors. 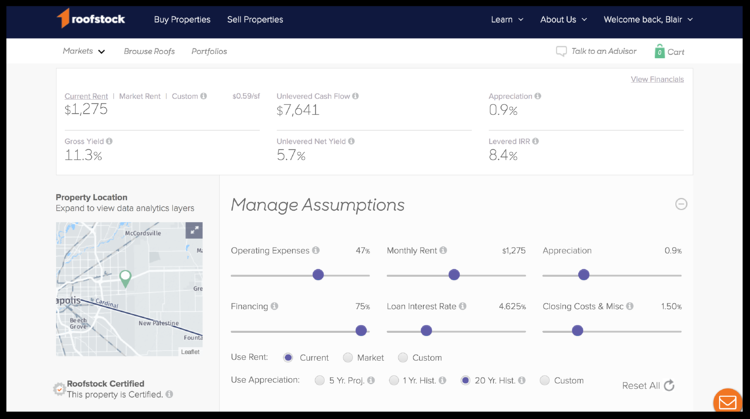 Unlike a basic math problem, there’s no one answer to the question of “How much should I spend on a rental property?” But with the right information, tools and resources, you can invest with confidence knowing the answer is right for you. The above is for informational purposes only and is not intended to be investment or real estate advice. You should always consult with your professional financial advisor prior to purchasing an investment property. 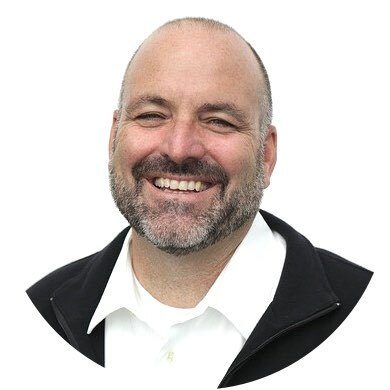 Scot Bolsinger has won more than two dozen press awards writing for major newspapers and online platforms. He is a senior partner with Off Road, an agency helping leaders drive change.